I love your buffalo wings but why can’t we make it with homemade breadcrumbs like the first time? OK, Matthew. I’ll make them again for you with homemade breadcrumbs. I’m glad you like the food I cook for you. Definitely make the Cincinnati Chili! It was the first CC/ATK recipe I tried and it converted me to Chris Kimball’s way of cooking. OK, I will. I wasn’t feeling that either “Texas Slow-Cooker Chili” or “Chili con Carne” was the ultimate chili. My search for the best chili continues. Next stop, Cincinnati. It looks good. Another question. Did you serve it over spaghetti? It seems so strange. We love the CC Cincinnati Chili recipe too! I add more allspice and garlic, but it is a family favorite. We visit Cincinnati often, and always hit one of the chili places there. My son always says “I like Mom’s chili better”. If you’ve not made the beef tacos yet move them up on your list. They are the only ones we’ll eat now. I make 2 double batches side by side and freeze one. I halve the cayenne though, it was too spicy as written for me. I just found your blog while trying to find ATK’s Beef Tips with Red Wine sauce (I’ve given away the magazine). This is such a cool idea, I cook from these magazines all the time though rarely have a chance to watch the show. I’ll add you to my favourites! What a great idea! 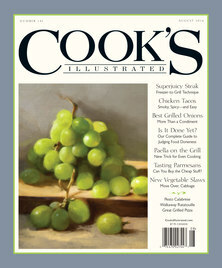 I have been a Cook’s Illustrated subscriber for years and tell almost anyone who will listen what a great resource they are for new & experienced cooks.You’ve done a fantastic job with this blog! Can’t wait to hear more. Thanks! I’m enjoying myself, and now my youngest son says he wants chef. So I guess there’s no stopping until my son takes over the blog. Hi Judy, thanks for your support. As someone who not only cooks, but cleans, the amount of a mess matters a lot to me. Have you tried making homemade mayonnaise yet? I would love to hear your outcome. I tried making a variation of garlic mayonnaise for a Spanish Tortilla a few years ago. But because I my blender did a poor job, and it was more sauce than mayo. Next time I want to try mixing it by hand. We made the skillet baked ziti with spicy (poultry) sausage last night. It turned out great and only used the one pan, well there was some other equipment but still one pan for cooking. Once all the ingrediants were prepped, dinner was ready in less than an hour. I made one substitution: I didn’t have cream but had some leftover evaporated milk so we used that instead. I made the oatmeal muffins that were featured with the granola recipe show. There is a bit of work involved – toasting and then grinding up the oatmeal into a flour but oh are they delicious! I’ve made the recipe 3 times already and everyone who tries them loves the taste. Worth the effort. Highly recommended. BTW – I really enjoy your site.